Linking with others undertaking flow assessments. To explain how a CFPS can link with environmental flow assessments being taken by others. ​To set out a process to identify when a CFPS may be required. How does a CFPS relate to flow assessments that are usually undertaken by scientists or Council technical staff? The CFPS is not a standalone flow assessment method. It is, however, a component specific to cultural values of Manawhenua that can compliment other flow assessment methods. We have stated that a CFPs is not a stand-alone flow assessment method. It is envisaged that Manawhenua will also have the opportunity to input to other assessments (undertaken by hydrologists and ecologists). Collaboratively they will shape an agreed flow regime. In the paragraphs that follow we suggest how and where this collaboration can occur. We do however with the caveat, that ultimately it is for Manawhenua to decide how they choose to work with non-Maori, in particular resource management agencies. those cultural values, opportunities, issues and flow attributes that were unlikely to be adequately addressed via existing EFA methods and are more appropriately addressed through a cultural assessment. The challenge, however, is to ensure that Manawhenua are engaged in this process and understand how other flow assessment methods are helping to address their needs. The proposed NES on ecological flows and water levels uses significance as a criterion to help identify the methods to be applied in a particular context. We have adopted a similar approach that could be used to accord significance. However, significance or the relative importance of a river to Manawhenua given its values and attributes can only be determined by Manawhenua. As the relative importance of values increases, the consequences of not meeting the goals and objectives of Manawhenua also increase. In iwi management plans and or in resource inventories whanau, hapū and iwi identify their beliefs, values and uses of resources. They are likely to engage in planning processes to protect these values and the river / flow attributes that contribute to that value. The presence of those attributes and values will influence determinations of significance. In addition to the presence of attributes and values, their condition (i.e., the level of modification) will also influence the level of significance accorded as will the ability of whanau to rehabilitate / restore or reverse the impacts of an activity. 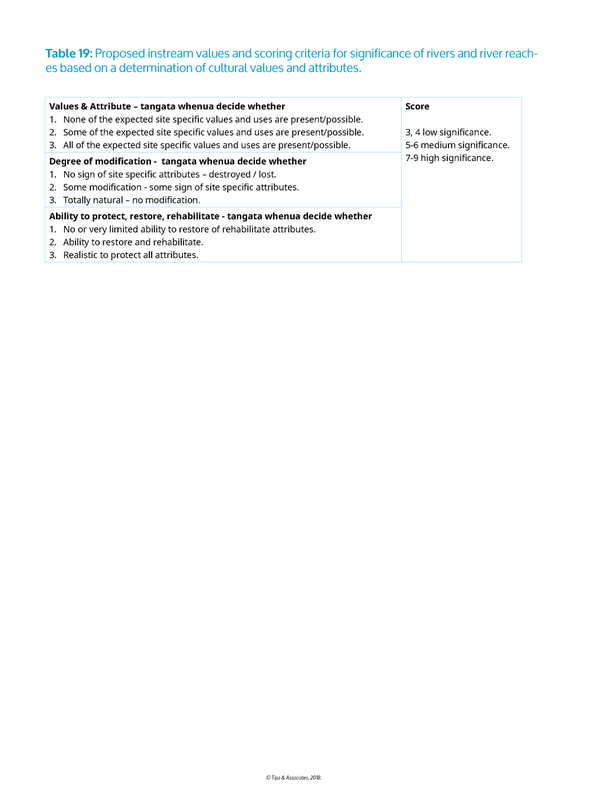 Having provided a score each for the three criteria in Table 19 (e.g., 2 for “some site- specific values present”, 2 for “some modification”, and 2 for “some ability to restore”) the three scores are summed. The combined score (of 6 in our example) represents a river/reach that is of medium significance. Rating rivers is inherently challenging for Māori. However, Table 19 is proposed as a possible means of according significance and is included to promote discussion. To reiterate, it is always the right of Manawhenua to determine significance and they may decide that all rivers in their rohe are of high significance. The proposed NES for Ecological Flows and Levels uses the degree of hydrological alteration to help in the selection of appropriate ecological flow assessment methods. 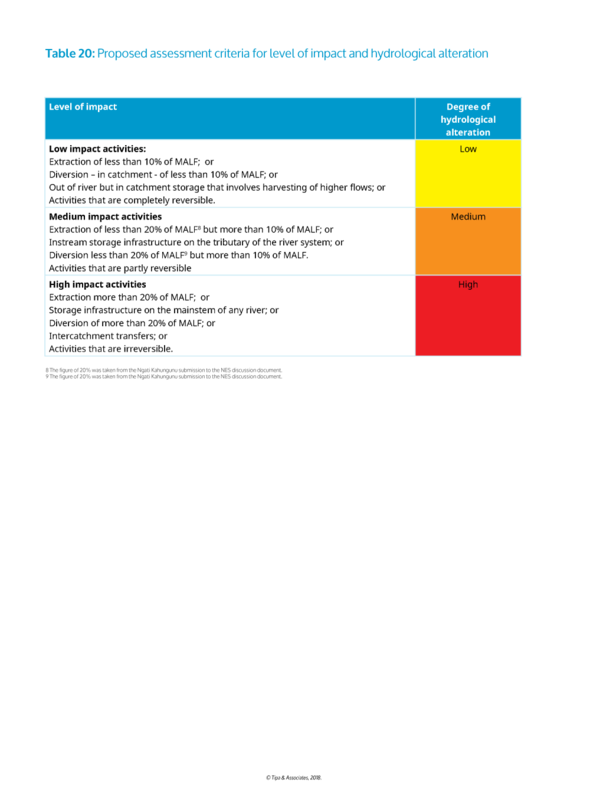 To make the assessment process “accessible” to Māori we recommend distinguishing between low, medium and high hydrological alteration based on the nature of the activity and potential level of impact. BECA (2008) explain that water use can be divided into three categories of increasing hydrological alteration. abstraction of up to 10% of the mean annual low flow (MALF) is barely measurable and therefore unlikely to result in significant biological effects in any stream. Abstraction of up to 20% of MALF is unlikely to result in significant biological effects in lake- or spring-fed streams or in streams with frequent floods and freshes, such as those draining mountainous regions exposed to the prevailing westerly winds. When total abstraction exceeds these limits, the magnitude and duration of low flow may have significant effects on biota. ​Water can diverted from rivers on a relatively large scale and may be returned to the river downstream or discharged into another catchment. A diversion or abstraction is considered large-scale when it can divert more than 90% of the MALF out of a river. With large-scale diversions or abstractions, the quality and amount of habitat at minimum flow will directly affect the biological communities because flows are at the minimum for substantial periods of time. River flows are modified by storage with potential change to the seasonality of flows, minimum flows, and high flows. Storage regulation can be consumptive (water supply or irrigation) or non-consumptive (hydro-electricity). The potential degree of regulation will depend on the storage volume in the impoundment. Storage regulation can affect all biologically important components of the flow regime. The proposed assessment criteria listed in Table 20 requires significant discussion with whanau, hapū and iwi before it could be finalised. However, it adopts a cautious approach based on the discussions presented in the BECA (2008) report and our interpretation of iwi submission to the proposed NES, but the levels may not address all the concerns of whanau, hapū and iwi given that some argue that any alteration is unacceptable culturally. Therefore, Table 20 must be considered as “illustrative” with the caveat that it needs to be the subject of further discussion with Manawhenua. To apply the criteria, Manawhenua are to identify the nature of the proposed activity and the level of impact for example inter-catchment transfers would be classed as a high degree of hydrological alteration. In contrast a proposal that involved out of river but in catchment storage of high flows (highlighted) may be classed as a low degree of hydrological alteration. Once again, however, it is the right of Manawhenua to determine all activities to be of high hydrological alteration. Having identified the cultural values, assessed the degree of significance and level of hydrological alteration (step 3), the next step (following the approach presented in the proposed NES) is to select an appropriate level of investigation. We have drawn together the significance criteria and the degree of alteration to develop a matrix. 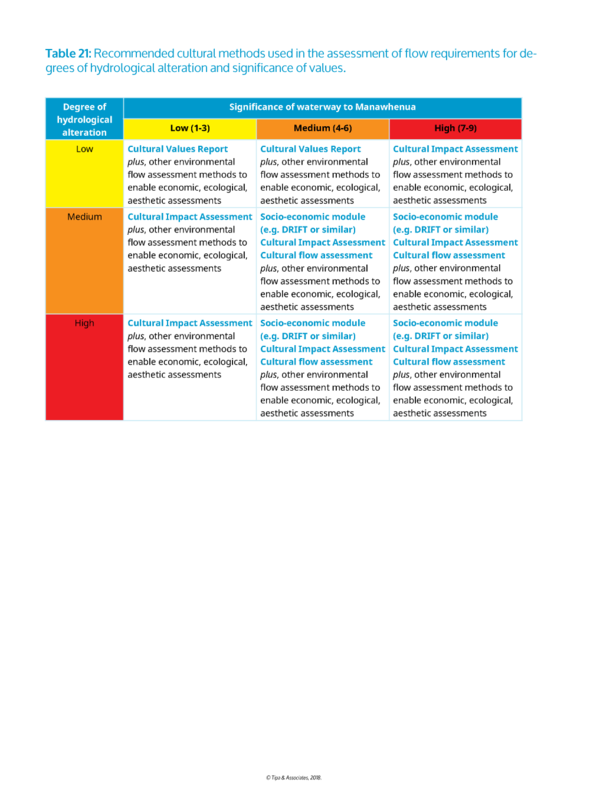 Table 21 is populated with suggested flow assessment methods based on a cultural determination of both significance and hydrological alteration. For example, where an activity that is likely to result in low hydrological alteration is to occur in a river reach considered to be of low significance, then it may be that a cultural values report from Manawhenua may suffice. In contrast, for an activity likely to result in a high degree of hydrological alteration in a river reach considered to be of high significance, then it is recommended that the socio-economic module from DRIFT be undertaken, along with a CFPS. These methods then complement assessments specific to ecological, recreational or amenity values identified by tangata whenua, stakeholders and communities. While it is beyond the scope of this Website to delve into the respective holistic methodologies in detail, it is important to consider the benefits of such methodologies. Their strength is that they provide decision-makers with information that usually remains unconsidered in water-resource developments, especially on potential human and ecosystem costs. The trend in setting environmental flows is for holistic methodologies to increasingly be run along with other hydrological based methods, and for more biodiverse, whole ecosystem approaches. Only Manawhenua can determine the significance of the reach or river to them. Manawhenua will specify the methods they wish to employ to inform a flow assessment process, recognising that multiple methods will be utilised.